Although Cyprus is the third-largest island in the Mediterranean, it only takes about four hours to get from one side of the island to the other by car. Between March and November, the temperature usually doesn’t drop below 20 degrees making Cyprus a great travel destination nearly all year round. During the summer months, temperatures can exceed 35 degrees — making the beaches and their cool waters popular amongst visitors — but the island has much more to offer than its beautiful coast! Conflicts in the 20th century led to the Turkish military occupying some northern regions from 1974, and consequently splitting the island into two parts. The border runs right through the country’s capital, Nicosia, where you’ll find an official border crossing point in the Old Town. Cyprus’ history, however, dates back much further than the 1900s. The island was actually the birth place of Aphrodite, which gave Cyprus its nickname: the Island of Love. 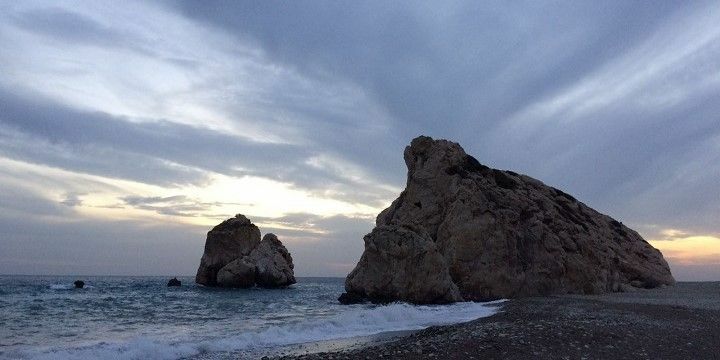 Petra tou Romiou — also known as Aphrodite’s Rock — which lies between Limassol and Paphos, is said to be the exact location where the Greek goddess of love rose from the sea. Aphrodite's Rock lies between Limassol and Paphos. Another landmark is the Temple of Apollon Ylatis. This local god was the protector of the city of Curium (Kourion) in the Limassol district between the eighth century B.C. 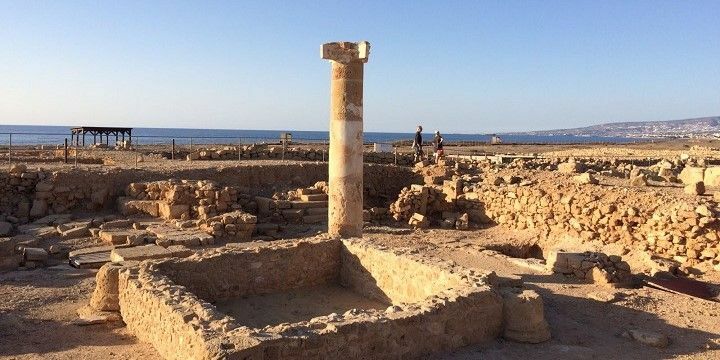 and the fourth century A.D.
Paphos — a port city, as well as a district, in the South West of Cyprus — is known for its large fields, under which a farmer discovered ancient mosaics dating back to a period between the third and fifth centuries. Fairly well-preserved, they display mythological scenes, such as the fight of the Greek hero Theseus against the Minotaur, or Hercules against the Nemean lion. The Tombs of the Kings is another must-see in Paphos. This impressive cemetery has around 100 tombs, and is located on top of a cliff, with stunning views over the sea. The Tombs of the Kings is a must-see in Paphos. The Troodos mountains — Cyprus’ largest mountain range, with vineyards, waterfalls, monasteries and traditional villages — lie in the middle of the island. The area is great for hiking and, if you’re lucky, you might even see some unique wildlife, such as the mouflon, the largest animal on the island. What many people don’t know is that the highest mountain — Mount Olympos (1,951m) — is also home to a small ski region, which is open between January and March. Where else in the world could you enjoy snow in the morning, and the beach in the afternoon? The Akamas Peninsula — a nature park with gorges and valleys — is located in western Cyprus. This area is also famous for Lara Beach, where hundreds of sea turtles lay their eggs every summer. The Akrotiri Peninsula, on the other hand, is the southernmost tip of the island. It is home to Cyprus’ largest lake: Akrotiri Salt Lake. Another stunning park — Cape Greco — is located in Cyprus’ southeast region and is the perfect place to enjoy great views from the limestone cliffs, or take a boat tour around the mystical caves. Ayia Napa is known for its beach as well as many pubs and clubs. 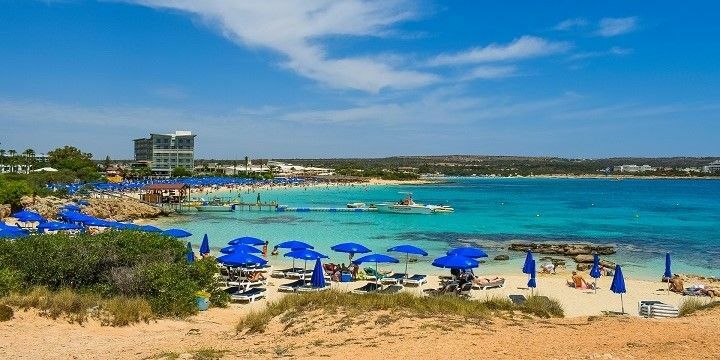 The park is close to the popular vacation spot of Ayia Napa, which is said to have the best beach in the area (Nissi Beach), as well as some great pubs and clubs, making the resort’s nightlife scene unmissable. If NextStop24 helped you to choose your next travel destination, we'd be very grateful if you’d search for your accommodation and things to do in Cyprus through these links. They're affiliate links, which means that we will receive a small commission for every booking made through them. There are no extra costs for you; you'll simply be helping to keep NextStop24 running. Thanks! Cyprus is the perfect island if you want to escape the European winter. It's close, affordable, and warm all year round.